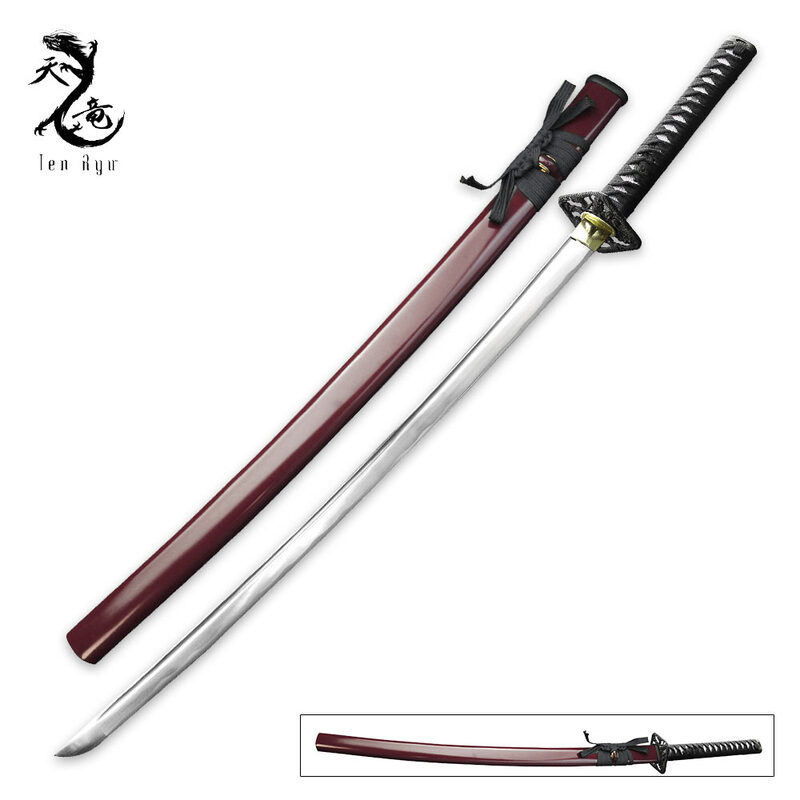 Ten Ryu Hand Forged Samurai Sword Burgundy | BUDK.com - Knives & Swords At The Lowest Prices! Ten Ryu swords are constructed for those who want a handmade, battle ready katana. Each Ten Ryu Samurai sword offers a full-tang, high-carbon steel blade that has been forged and tempered using proven methods. Each Ten Ryu is a prized showpiece for collectors. 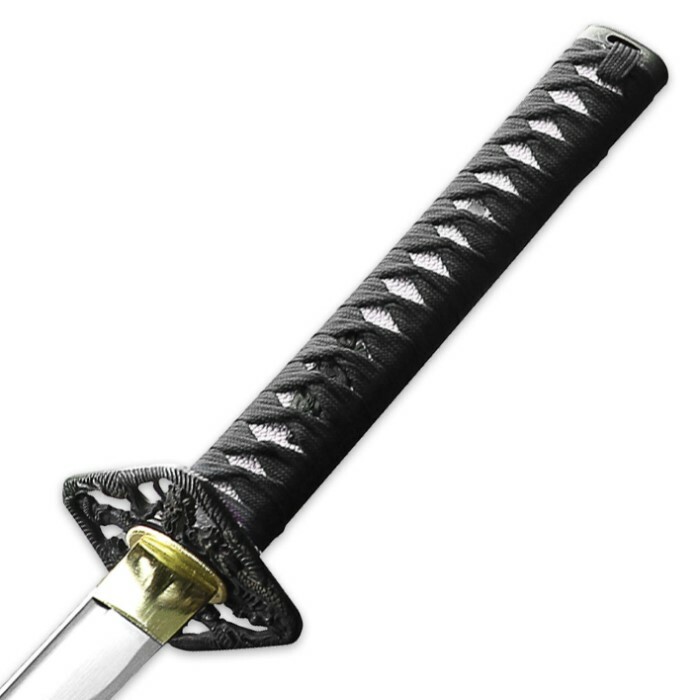 This katana has a magnificent 27 9/10” carbon steel blade with a traditional blood groove. The handle is covered in genuine rayskin and traditionally wrapped in black cotton and the decorative tsuba is a metal alloy in the Oda Nobnaga style. 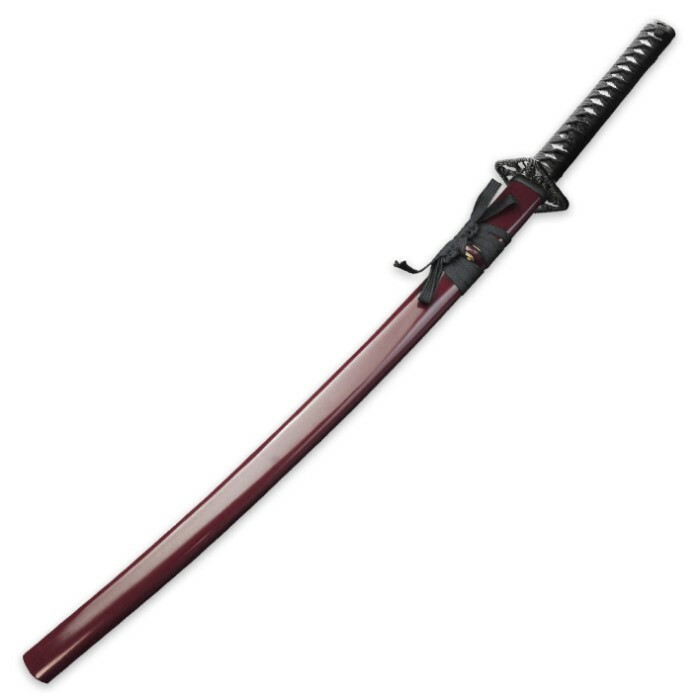 The burgundy lacquered scabbard compliments the overall look of this sword. A black cotton sword bag is included. This Samurai sword is 43 7/10” in overall length. This is an amazing blade for the price. You can definitely tell that it is hand forged. There is no machine edge. It is hand sharpened with a beautiful hamon. The tsuba is SOLID. the saia is very well made with a beautiful sheen to it. Very nice and tight wrap on the handle. The only problem with this katana, is that the hibaki is loose. It's not the worst I've seen, but, it's still loose. A quick fix with a thin wooden shim on each side (shim on both sides to keep it even on both sides.) Should fix the problem. The edge isn't RAZOR sharp, but it's definitely sharp. All in all I'd day it's a 4/5 ?. By the way this sword came in the mail very quickly for standard shipping. Thanks BUDK crew!! !